Milford honors submarine pioneer and local resident Simon Lake by displaying a submarine at a Milford Harbor marina. 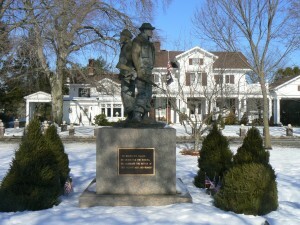 Simon Lake, a New Jersey native, lived in Milford between 1907 and his passing in 1945. Lake launched the first submarine to operate in open water, the Argonaut, Jr., in 1898. 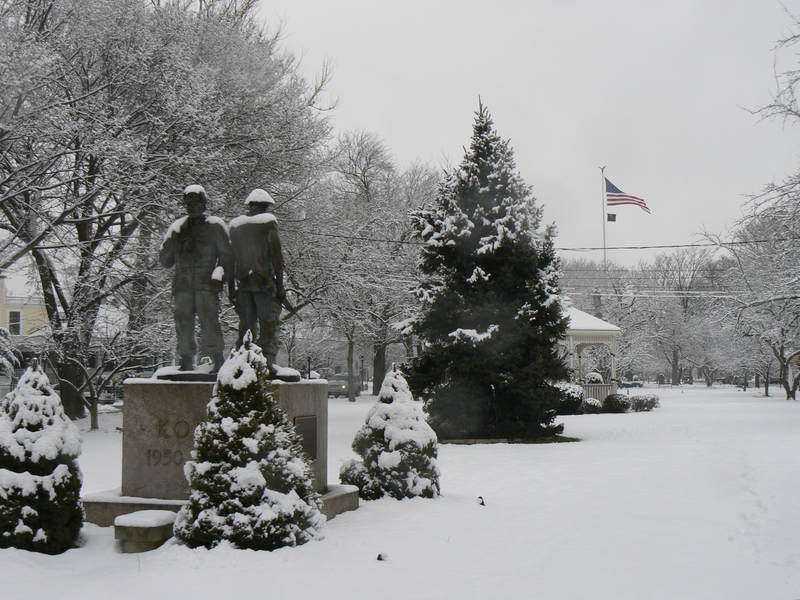 Between 1909 and 1923, Lake built 33 submarines for U.S. Navy and also constructed vessels for European nations. 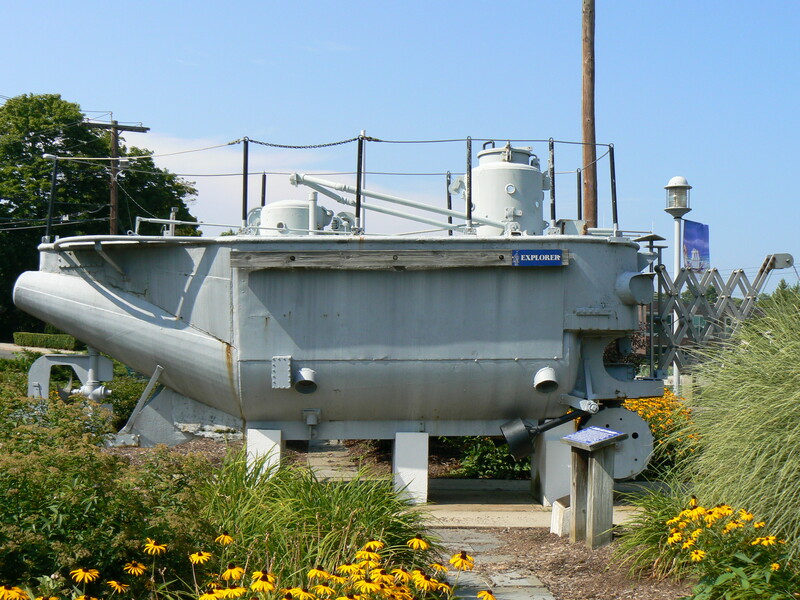 Lake’s last submarine, the two-man Explorer, was built in 1936 and was designed for civilian uses such as underwater research, mining and oil drilling, and wreck hunting and salvage. 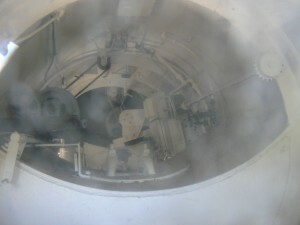 During underseas operations, the Explorer depended on a mother ship for air and power. Divers entered the Explorer through the round hatchway. Peering inside the sub’s front windows reveals an array of switches, valves and chains. 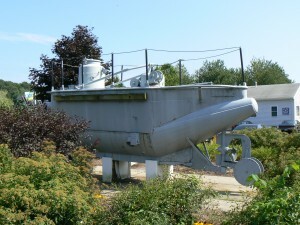 World War II reduced civilian demand for submarines, and the Explorer was stored in drydock and remained there until 1950. 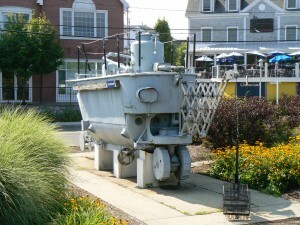 After years of neglect, the Explorer was placed on display outside Bridgeport’s Museum of Art, Science and Industry (today’s Discovery Museum) until 1974. The Explorer was restored and displayed at the Groton Navy Submarine base before it returned to its current location in Milford during the late 1990s. Between 1960 and June 2010, Milford also had an elementary school that bore Simon Lake’s name. 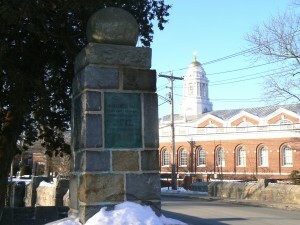 The school produced a newsletter named the Explorer. 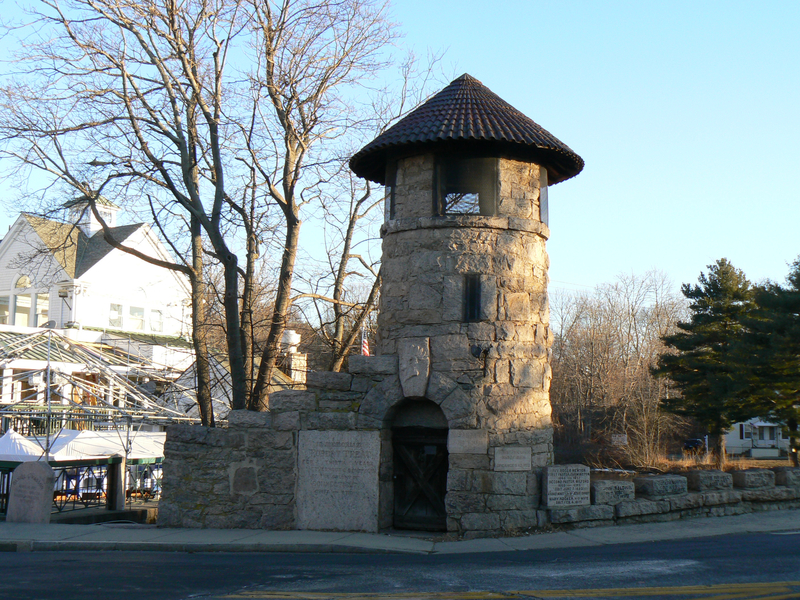 A large boulder in the Devon section of Milford once served as a lookout station during the American Revolution. 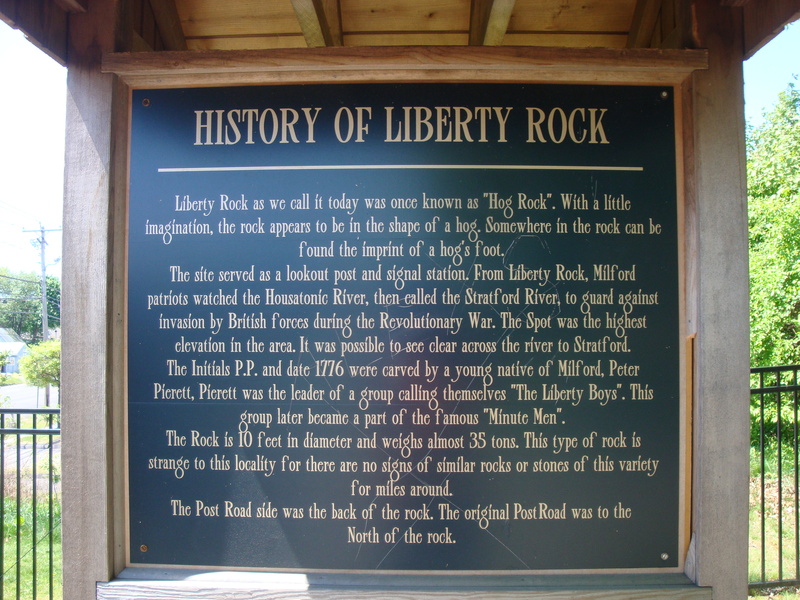 Liberty Rock, the highest point in its neighborhood, was used during the revolution to observe nearby Long Island Sound as well as the Boston Post Road. The large boulder, originally known as Hog Rock, was renamed Liberty Rock in 1897. A brief dedication was carved into the rock’s southern face. 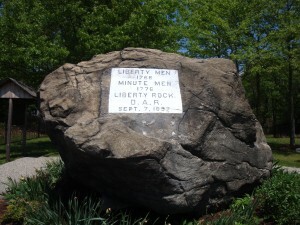 The rock once had a plaque under the carved dedication, but the plaque was removed at some point over the year. 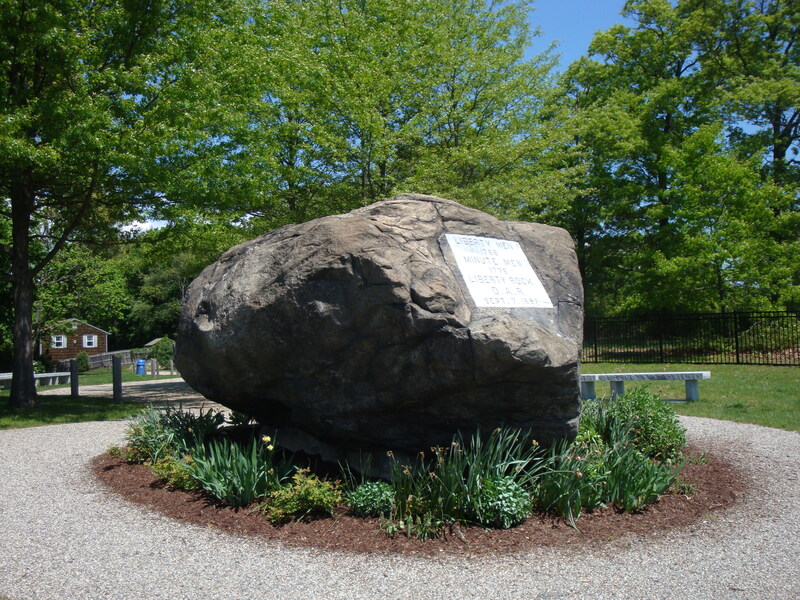 The boulder is now the central feature of a small park that was restored in 2006. 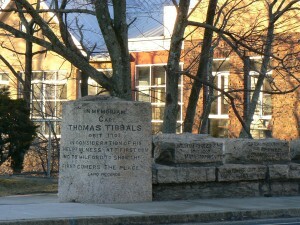 During the restoration, a marker explaining the site’s history was added, as were pathways, a flagpole and stone benches. 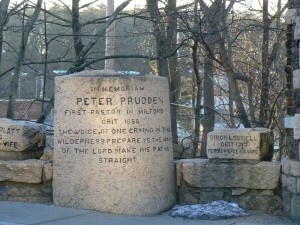 A series of small markers atop wooden stanchions added at the time have mostly been removed by vandals. The site stands on the Post Road, alongside the on/off ramp to Interstate 95’s Exit 34. 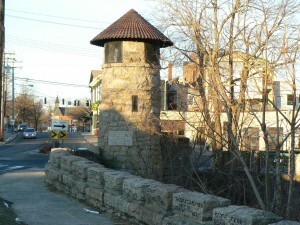 Milford honors its founders and Native Americans with an 1889 bridge on the site of the city’s first mill. 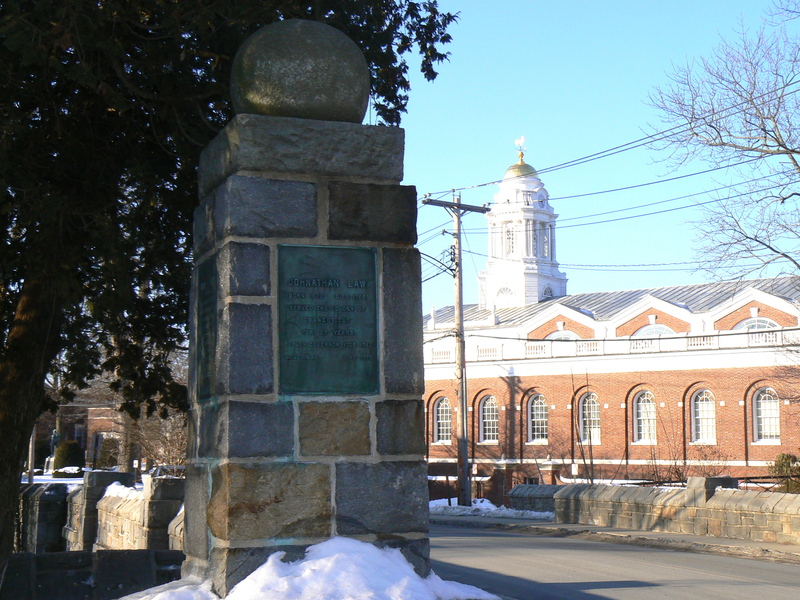 The Memorial Bridge, across the Wepawaug River along today’s New Haven Avenue, was built as part of Milford’s 250th anniversary celebration. 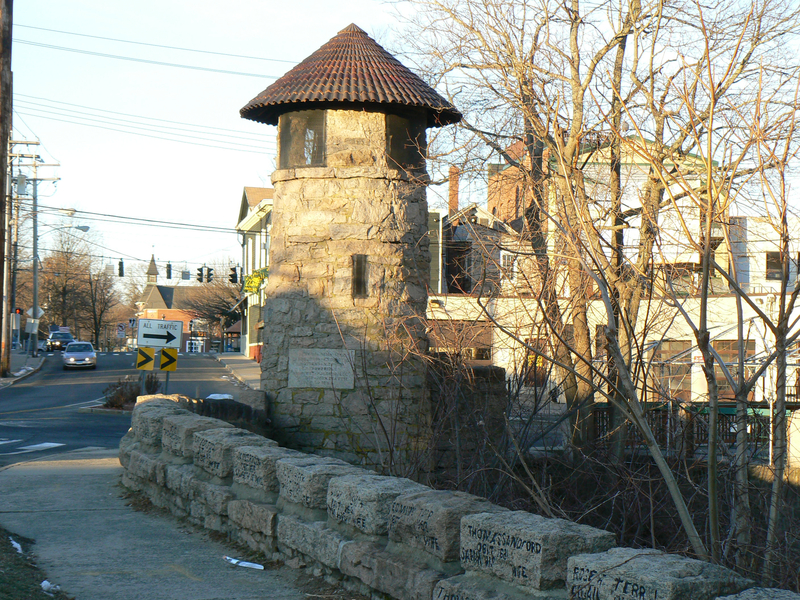 The bridge features a tower and 29 stones inscribed with the names of local settlers, as well as an eclectic collection of local artifacts. 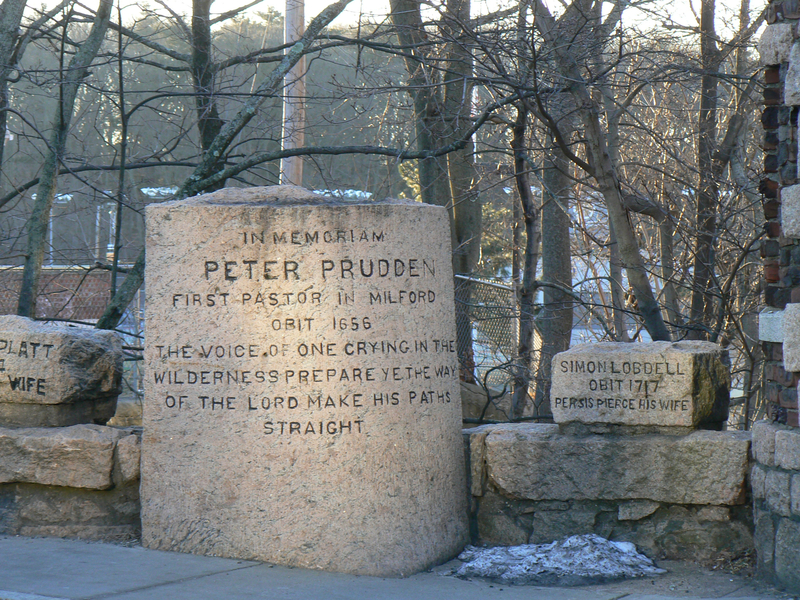 The bridge’s north and south copings are marked with large pink granite stones inscribed with the name of an original settler, as well as the name of his wife and date of his death. 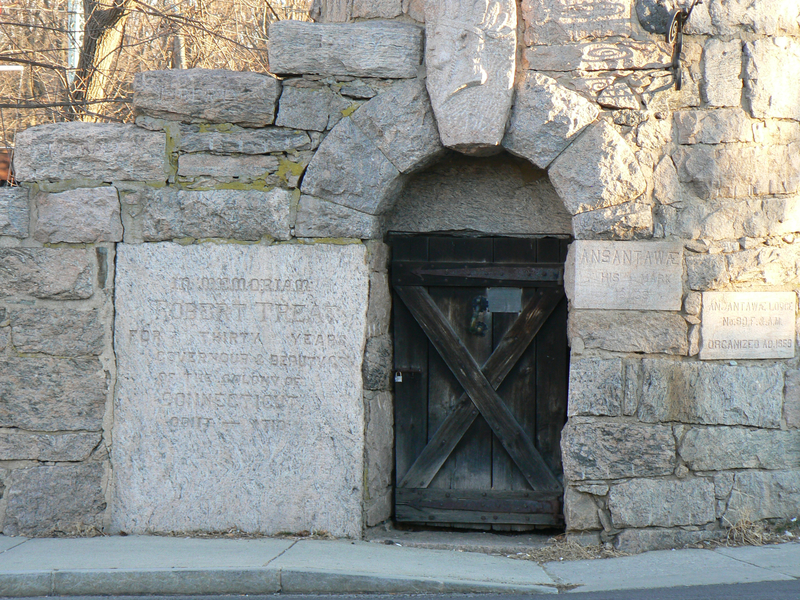 Next to the doorway leading into the 29-foot tower is a large stone inscribed with a dedication to Robert Treat, an early Milford settler who served as governor of the Connecticut colony. 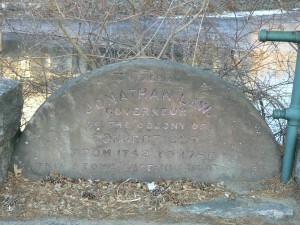 A later governor, Jonathan Law, is honored with a stone (the former doorstep of his home) on the bridge’s north coping. The front entrance also honors the area’s original settlers from the Wepawaug nation with a stylized Native American portrait over the doorway and a representation of the mark by which Ansantawae, the nation’s sachem, signed the deed for the purchase of Milford. On the doorway, a knocker was taken from the front door of a home with a porch from which George Whitfield, a founder of the Plymouth Church, preached. 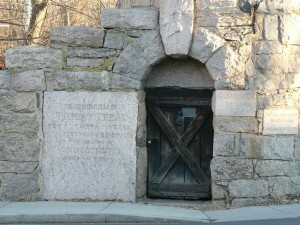 The doorway also features the hanger for a lantern that has been lost over the years. 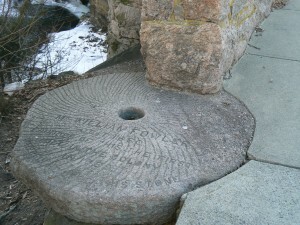 The bridge’s buttress features a stone from the town’s first mill. 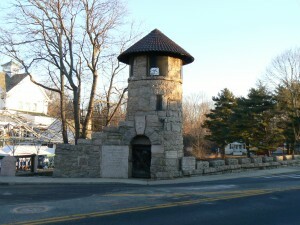 A stone just north of the bridge tower honors Milford police officer Daniel S. Wasson, who was killed in the line of duty in 1987 during a late-night traffic stop. Local officials commissioned the bridge in 1889 to honor Milford’s original settlers, in part because the settlers’ final resting places aren’t known. 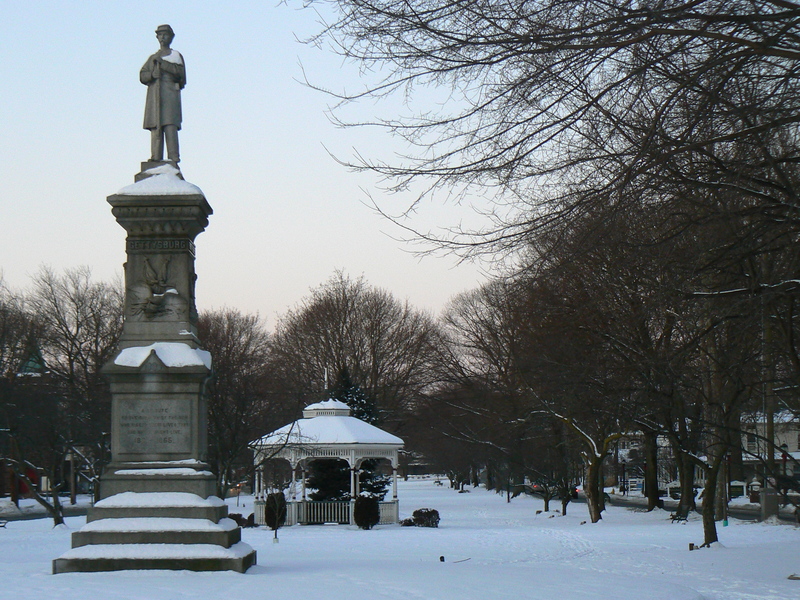 As settlers passed away, they were buried in what would become Milford Cemetery. 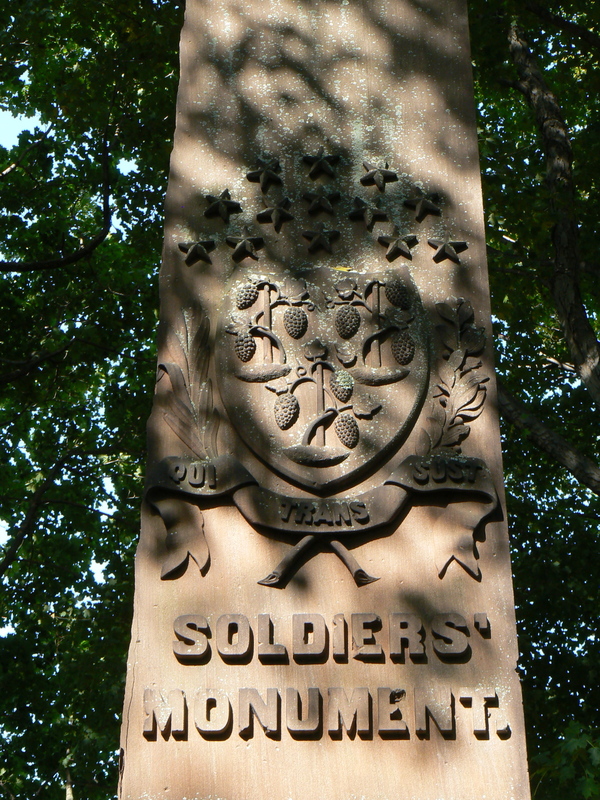 Those graves were either unmarked, or marked with wooden headstones that were eventually lost to time. A hundred years later, officials marking the city’s 350th anniversary erected a plaque listing the names of early settlers who had been omitted from the bridge. We’re paying a return visit to the 1888 Soldiers’ and Sailors’ monument on Milford’s green, and this time we’re including the holiday lights decorating the green. 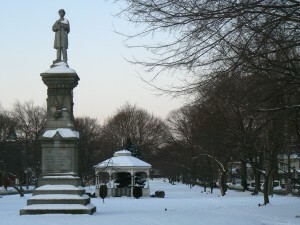 We first looked at the monument last February, when the green was covered with snow. 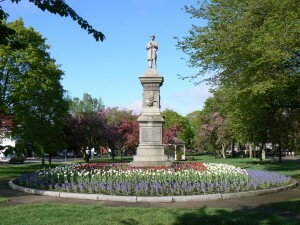 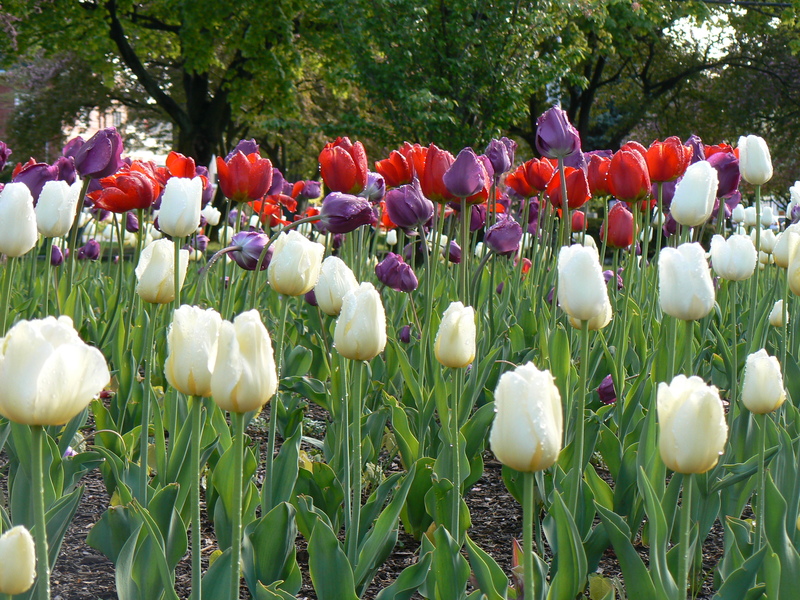 And we paid a return visit to the monument in early May, when the planting bed at the base of the monument was filled with a variety of festive spring flowers. 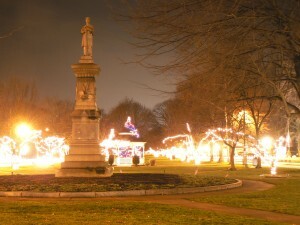 We hope you’re enjoying this year’s holiday season. 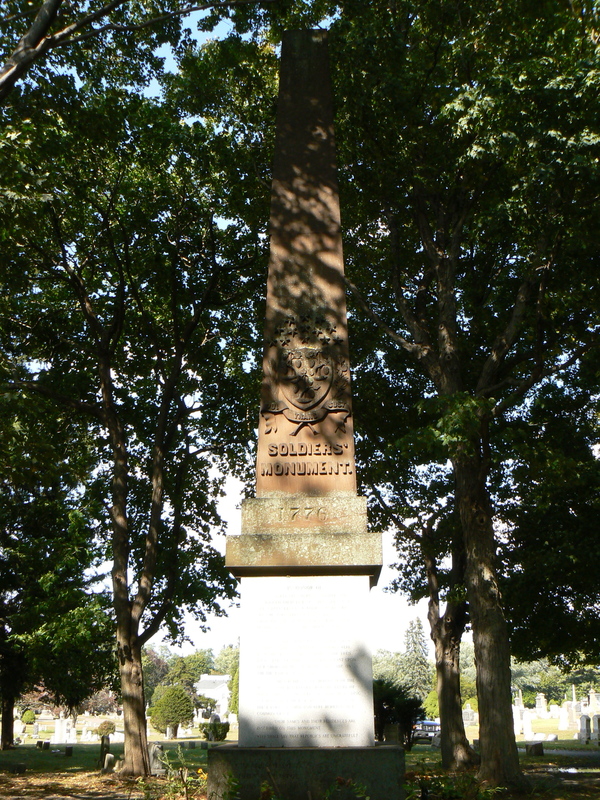 Milford honors the common grave of 46 smallpox-infected Revolutionary War prisoners of war who died in the city in 1777 with a brownstone obelisk. 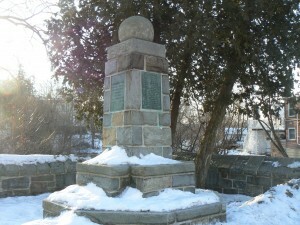 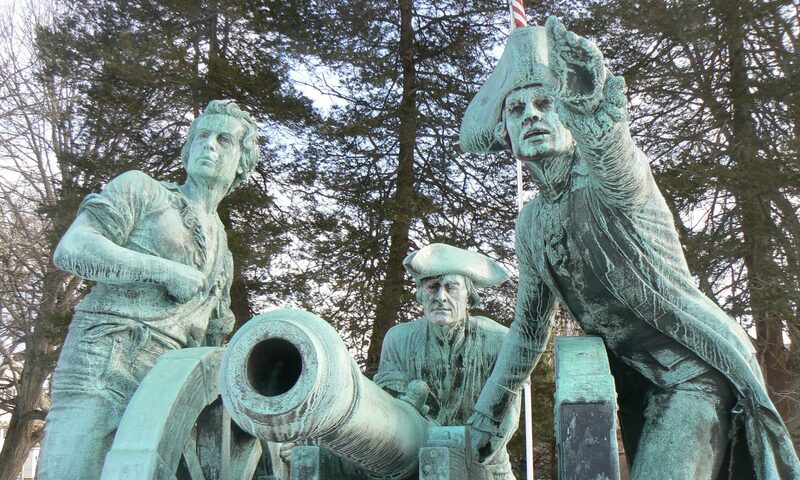 The 1852 monument, in Milford Cemetery, honors infected Continental soldiers who were released onto a Milford beach on January 1, 1777 by British forces. 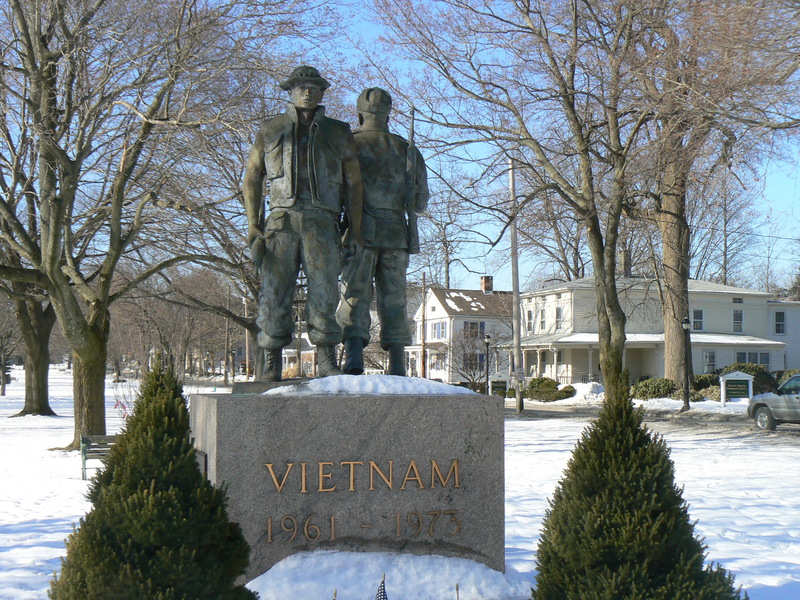 Many of the soldiers were able to leave Milford, but nearly a quarter died in the city. 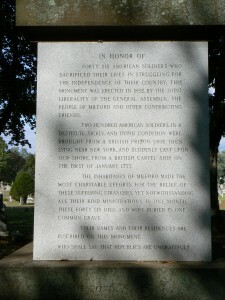 This dedication, which also explains some of the background behind the soldiers’ fate, was attached to the monument later. 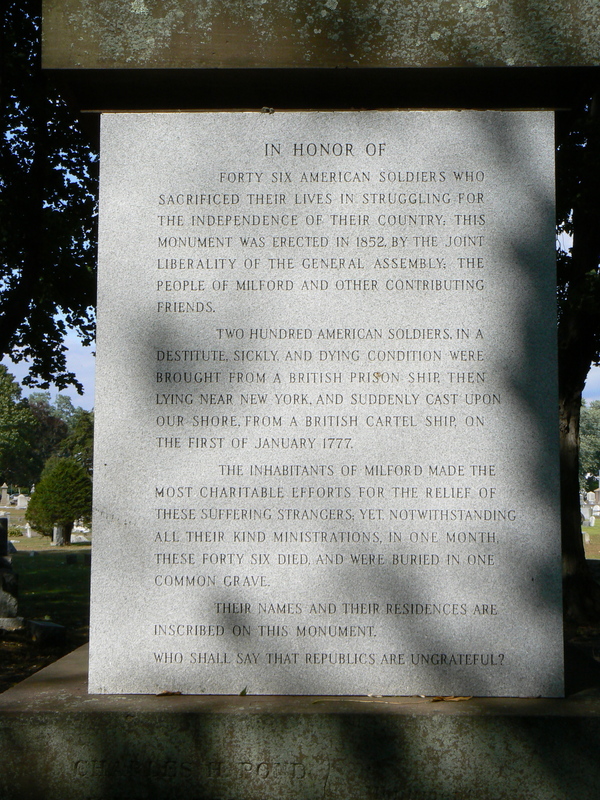 We’re assuming it was added in 1976 for the nation’s bicentennial, because a similar granite marker at the foot of the monument’s north face that lists Milford soldiers who fought in the revolution bears a 1976 date. The south face also bears an inscribed Connecticut seal and 13 stars honoring the original colonies. The east face of the brownstone obelisk bears an original inscription honoring Capt. 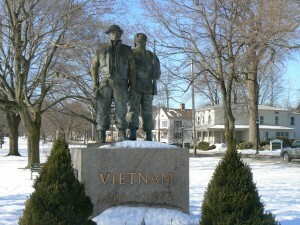 Steven Stow, a Milford resident who cared for the infected soldiers unable to travel home. 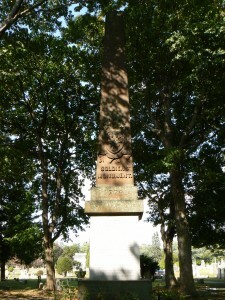 Stow contracted smallpox and died on February 8, 1777 at the age of 51. 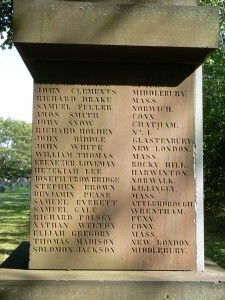 The north and west faces list the deceased soldiers, who are buried in a common grave near the monument. 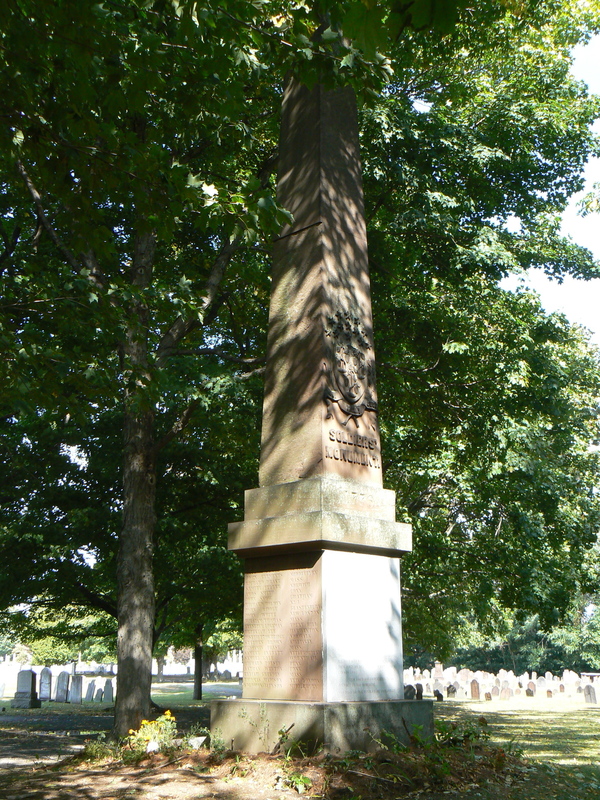 The exact location of the grave is being studied by researchers, who are also looking for a time capsule mentioned in the program for the 1852 dedication. 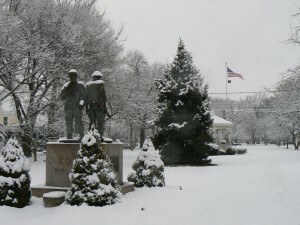 The site has attracted considerable interest lately, with the discovery of a skull belonging to one of the prisoners at the University of Connecticut’s archaeology department. 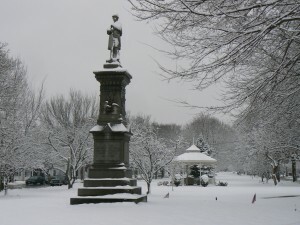 The skull, which belonged to the New Haven County Historical Society, is going to undergo DNA testing before it is buried, most likely in Milford Cemetery. 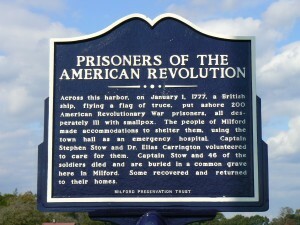 A marker on Milford’s Gulf Beach, across the harbor from the actual landing site, honors the soldiers. One of the infected prisoners, Herman Baker of Tolland, died on an East Hartford farm while attempting to return home. 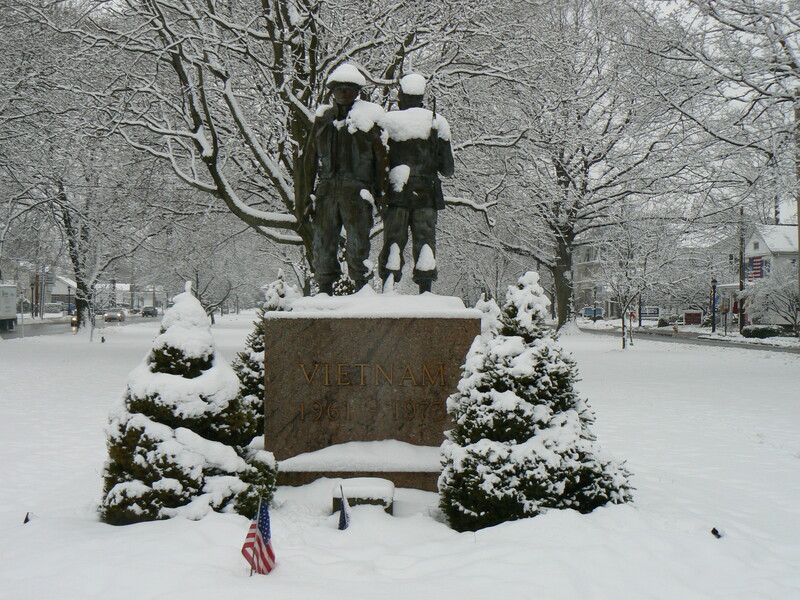 His grave is within the Pratt & Whitney complex, and is maintained by the company as a tribute to American soldiers. 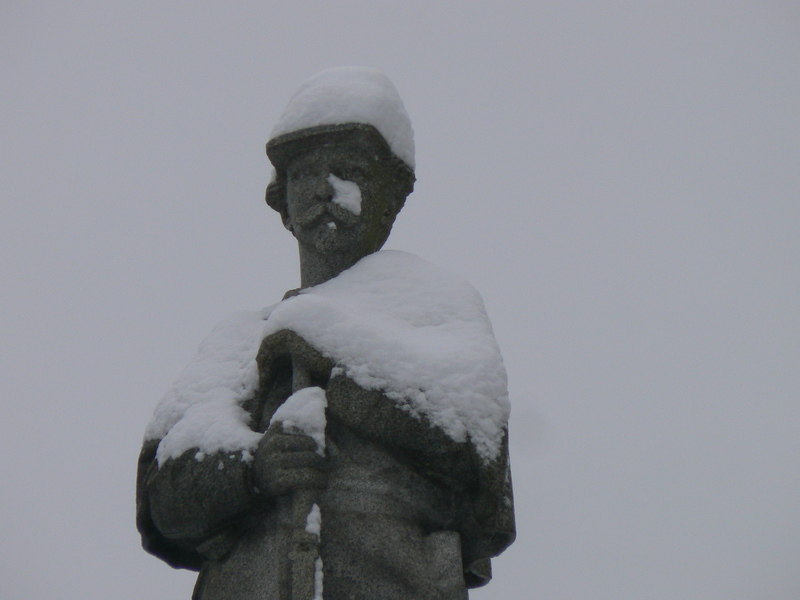 The first time we highlighted the 1888 Soldiers’ and Sailors’ Monument on Milford’s green, it was early February and southern Connecticut was covered with what appeared at the time to be perpetual snow cover. 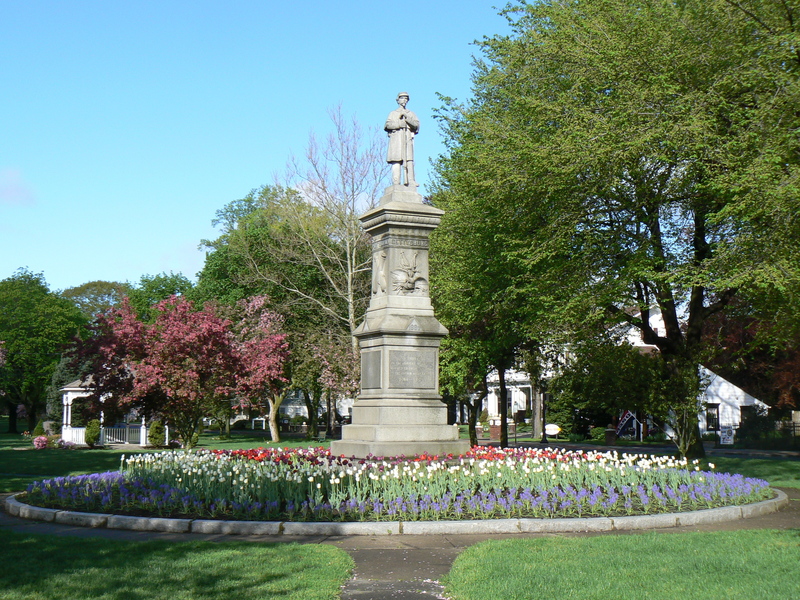 Now that winter has gradually faded into spring, we noticed the impressive collection of flowers surrounding the base of the monument and, given a brief break from the rains of the past week or so, decided the monument warranted another post. 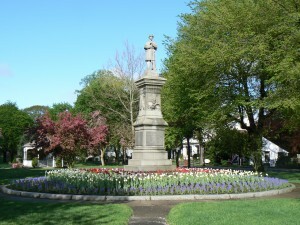 The monument sits at the center of a round planting bed that features an outer ring of what we believe to be in the hyacinth family (we’re somewhat embarrassed to admit that we know so little about plants that our first two guesses at how to spell “hyacinth” stumped Google, and we eventually had to search for “purple flowers”) along with several rows of white, purple and red tulips (those we know). 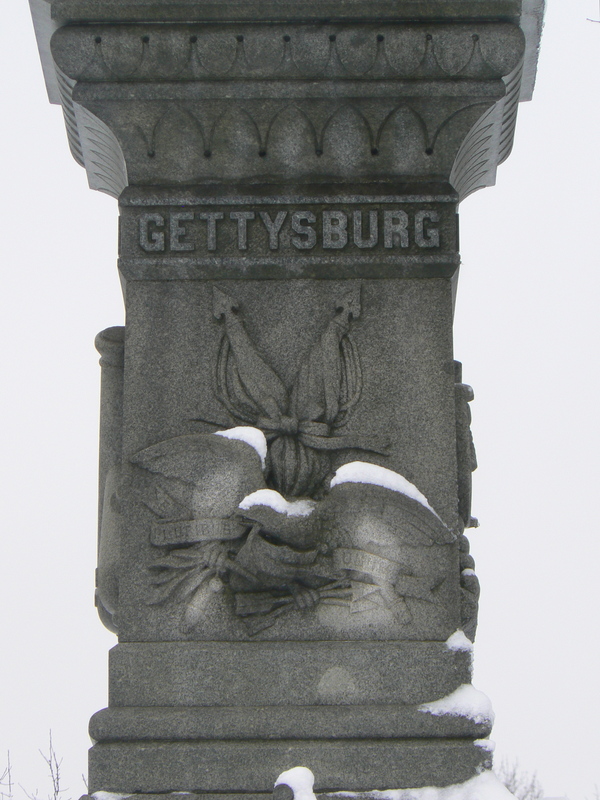 As we mentioned in February (the bottom image is from that post), the monument was dedicated in 1888 to honor the service of local Civil War veterans in battles including Gettysburg, Fort Fisher (N.C.), Port Hudson (La.) 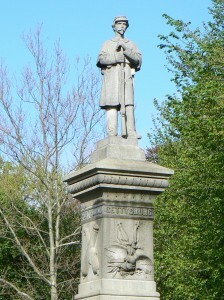 and Appomattox. We conclude this week’s look at monuments in downtown Milford with a 1939 monument to three Milford residents who served the state of Connecticut as governors. The monument sits on a bridge across the Wepawaug River (named after the native settlers who sold Milford to colonists), northeast of the City Hall we featured earlier this week. 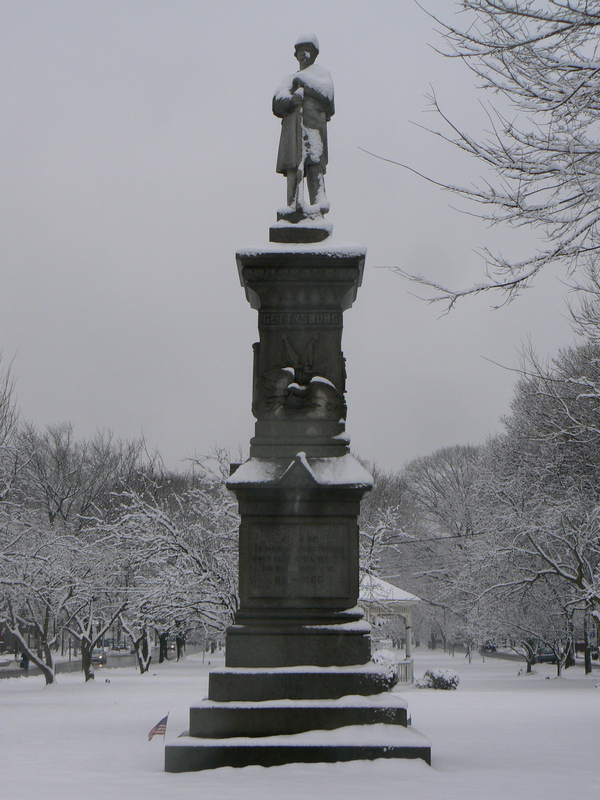 Robert Treat (1622-1710) was one of Milford’s founders, and served as governor from 1683 until 1698. 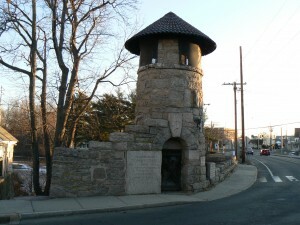 Treat was also a co-founder of Newark, NJ between 1665 and 1672. 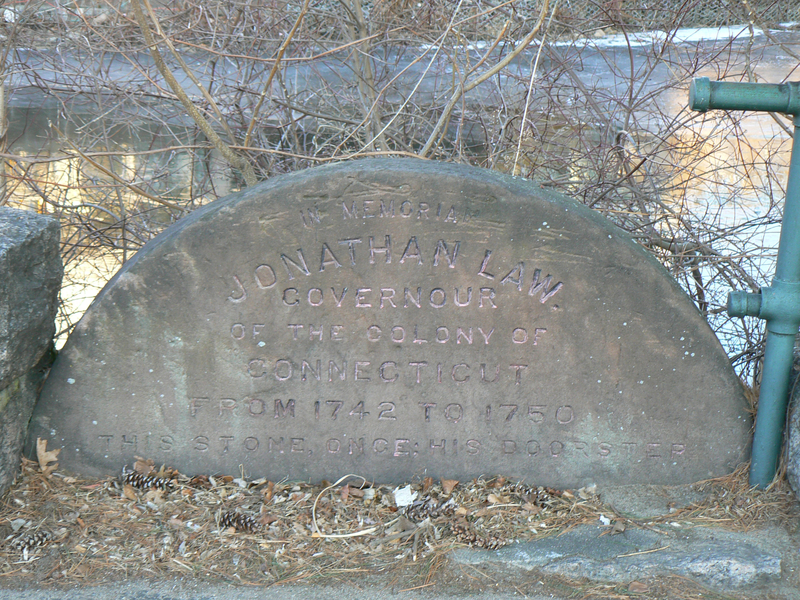 Jonathan Law (1672-1750) served as governor from 1742 to 1750. 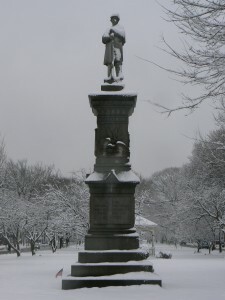 Charles Hobby Pond (1781-1861) served as governor from 1853 until 1854. 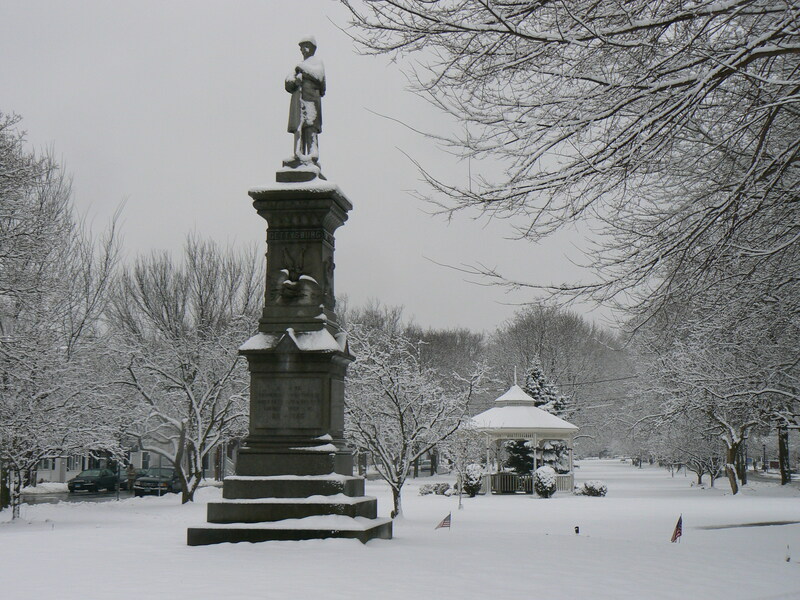 All three men are buried in Milford Cemetery, and have several local streets and landmarks (including Jonathan Law High School) named after them. 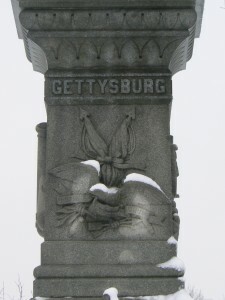 The monument sits on the Jefferson Bridge, so named because the first bridge on that location was built in 1802 during Thomas Jefferson’s presidency. 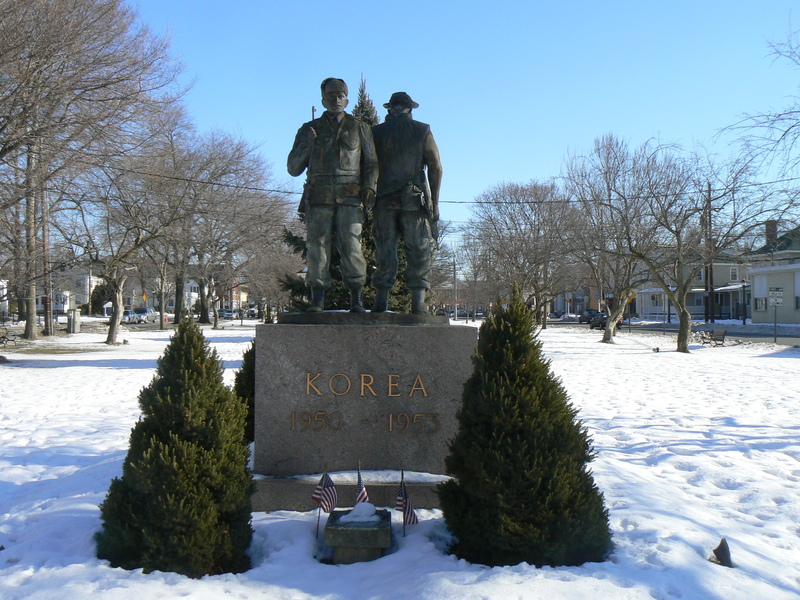 This week’s look at monuments in downtown Milford continues with some images of the Korea and Vietnam wars memorial located near the west end of the Milford Green. The monument was dedicated on Veteran’s Day, 1986. The memorial flagpole near the center of the green lists the names of four local residents who were killed during the Korean War, as well as the names of 11 residents who were killed during the Vietnam War.